The Asheville Tourists capped off an amazing second half of their season by winning the South Atlantic League championship with a 4-1 victory Saturday night in Hagerstown, Md. 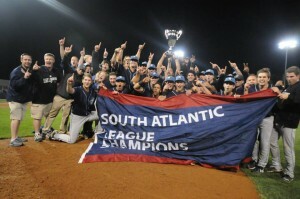 The title is the second in the past three seasons for the Tourists, and the eighth in team history. Prior to winning the SAL in 2012, the Tourists had gone 27 years without winning a league championship. Starting pitcher Konner Wade threw seven scoreless innings, allowing five hits with six strikeouts and no walks. First baseman Correlle Prime gave the Tourists an early 1-0 lead with a first-inning RBI single and outfielder Raimel Tapia hit a home run to lead off the third inning to increase Asheville’s lead to 2-0. Second baseman Zach Osborne struck what was essentially the knockout blow with a two-run double in the fourth inning, giving the Tourists a 4-0 lead. Reliever Troy Neiman allowed a run in the eighth inning, before Trent Daniel came in to replace him. In the ninth, Daniel walked the leadoff batter but retired the next three hitters to close out the game and clinch the SAL title for the Tourists. The best-of-five series went to a decisive fifth game after Hagerstown rallied on Friday night from a 3-0 deficit, scoring five runs in the sixth inning. A two-run home run from Suns outfielder Cody Dent broke a 3-3 tie and Asheville couldn’t recover, eventually losing 6-3 and pushing the series to Saturday night’s final game. Squandering a lead like that with a championship in sight might have mentally derailed some teams, having to play a game they were so close to avoiding. But coming back assertively in Game 5 is a testament to the Tourists players, manager Fred Ocasio and his coaching staff. Wade didn’t pitch in the Southern Division playoffs versus Savannah, yet was dominant during his two appearances in the SAL finals. The right-hander won both of his starts, allowing no runs and eight hits in a combined 12 innings. 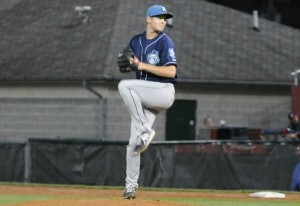 Wade also notched 12 strikeouts while walking none, a noticeable improvement from his regular season performance. A 2013 seventh-round pick out of the University of Arizona, Wade started 25 games for the Tourists (appearing in 27 overall), compiling an 8-8 record and 3.61 ERA. Outfielder Jordan Patterson was another standout during the SAL finals. In five games, Asheville’s right fielder batted 9-for-22 (.409) with two doubles, one triple, two home runs and four RBI. Prime hit 8-for-22 (.364) with four RBI. Daniel allowed no runs or hits in 1 1/3 total innings of relief, earning two saves in the series. With their 5-2 postseason mark (including a two-game sweep of Savannah in the Southern Division playoffs), the Tourists compiled a 94-51 record overall for the 2014 season. That surpasses the 93 victories that the 2012 club earned on its way to the SAL championship under then-manager Joe Mikulik. At 89-49, Asheville had the best overall record in the SAL, which qualified the team for the postseason. But the Tourists also clinched a playoff berth by winning the second-half Southern Division title, finishing 7 1/2 games ahead of Savannah. Altogether, this season was quite a turnaround for a club that went 63-73 last year and finished sixth in the seven-team Southern Division. Yet with the talent that Ocasio knew was coming his way when the Colorado Rockies assigned players throughout their minor league system during spring training — such as Tapia, outfielder David Dahl and third baseman Ryan McMahon — there were aspirations toward a league championship before the season even began.